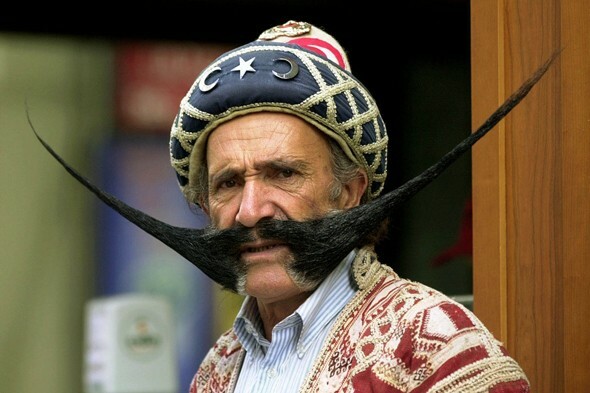 If you feel that your moustache needs perking up you should head to Turkey. If the urge to chase down tornadoes takes you then you should probably try hunting them in the United States. And if you've always wanted to set petrol-soaked rags alight and hurl them at people in the streets then El Salvador should be top of your holiday wishlist. In fact all of these bizarre holiday activities and more are par for the course in some travel destinations. We've collected our favourite strangest things to get up to abroad, and there are some brilliant ones, from swimming in beer in Austria to pretending to be an illegal immigrant in Mexico. Tell us which whacky activity takes your fancy below. Being covered in live snakes sounds more I'm a Celebrity... than holiday spa treatment, but Ada Barak has been offering visitors to her carnivorous plant farm in Talmei Elazar, Northern Israel, since 2006. Barak believes that physical contact with the reptiles can be a relaxing experience and said: "Some people said that holding the snakes made them feel better, relaxed," she said "One old lady said it was soothing, like a cold compress." If you're keen on the idea you can be reassured by the fact that the snakes used are all non-venemous. Most people run away from hurricanes when they see them, but the thrill seeking folk at Storm Chasing Adventure Tours specialise in holidays that put their guests right in the eye of the storm. Their six-day storm chasing tours take place in Tornado Alley in the Great Plains of the United States and come with a 'tornado guarantee' that promises if your tour has less than two days of viewing storms that have been issued tornado warnings by the National Weather Service, they'll give you a $200 discount on next tour. From £1,717 per person. We've all heard of medical tourism, but those who suffer from a bald upper lip can now get a moustache transplant holiday in Turkey. Cosmetic surgeons have been performing hair transplants on balding men for years but there's a growing trend in Asian, European and the Middle Eastern men visiting to give their melancholy moustaches a bushy surgical boost. Turkish surgeon Selahattin Tulunay started facial follicle transplants two years ago and says he completes up to 60 operations every month. He told The Wall Street Journal: "The moustache is making a comeback. If a man's moustache doesn't grow, he wants to know he can have one as a mark of masculinity." You aren't a man in Monglia unless you've mastered the 'three games of men' - horse racing, wrestling and archery. The Naadam festival dates back to 1225AD and Mongolian men still meet every July to battle each other in the chosen sports of manliness. Think you could take on a Mongol warrior? Then put your money where your muscles are because according to absoluetchinatours.com "Everyone can apply to compete in Naadam, regardless of his or her ethnic origin and religious belief." If spectating is more your sport, discovermongolia.co.uk runs an eight-day trip to Mongolia taking in Naadam's opening ceremony and tournaments. How would you like to experience what illegal immigrants feel when they cross the border into America? A small border town in Mexico has recreated the terrifying ordeal with their La Carminata Nocturna (night hike) where over 100 residents from El Alberto simulate a night crossing for tourists, complete with fake border guards and immigration officials, all for the small fee $18 (£12). The four-hour trek starts with border control agents pursuing participants with sirens and flashing lights as they scramble under fences and run through the brush to escape. According to filmmaker Jamie Meltzer, who documented his hike in his film La Caminata, the adventure is less for fun and more to raise awareness of the horrifying situation migrants put themselves in. Love beer so much you wish you could bathe in it? At the Starkenberger castle brewery in the forested hills of Tarrenz, Austria, you can do just that in their beer spa and beer baths. In the brewery's fermentation cellar you'll find the world's the first beer swimming pool designed by artist Wernfried Poschusta and specially filled with about 12,000 litres of water and 300 litres of Biergeläger beer. Probably the only time you'd be happy to drink your own bath water, this boozy bath experience starts from £192. Want to awaken your inner crouching tiger, sleeping dragon and always dreamed of being a real life karate kid? Join the China Kunyu Mountain Shaolin Kung fu Academy with bookmartialarts.com and train as a Shaolin warrior for an entire year in China. The intense training schedule involves 5.50am wake up calls and hours of training and meditation every day as well as teaching from 34th generation Shaolin monks and kung fu masters. The 365-day course costs from £3,371 per person. Not content with merely observing live volcanoes, tierratour.com runs an action packed day trip in which guests hike up one side of an active volcano and then board down the other side of it at up to 70 km per hour. The five hour tour can be booked from the colonial cities of Granada and Leon in Nicaragua and start from £23 per person, including transport, equipment and bilingual guides. Plastic surgery tourism is becoming more and more popular as tourists decide that they can get expensive plastic surgery treatments at bargain basement prices on the continent. If you fancy getting a new nose or some fat sucked out in Eastern Europe, newlookholiday.co.uk offers cut price treatments in Kosice, Slovakia. You can go under the knife before recuperating by exploring the city that's been picked as the 2013 European Capital of Culture. Las Bolas de Fuego is a festival that appeals to the pyromaniac in all of us. Join the residents of Nejapa in El Salvador in August to eat tamales, taste some local coffee and chuck kerosene-soaked, blazing rag balls at people in the streets. According to the tourism website of El Salavdor, the festival dates back to the eruption of the El Playon volcano more than 100 years ago, when huge balls of fire were hurled into the air. If these activities aren't weird enough for you, take a look at our collection of the strangest festivals around the world, we've got everything from baby jumping in Spain to punching your neighbours in Bolivia! Carnivores might not be thrilled at the prospect of a vegetarian festival, but this is no average event. The festival, which continues for nine days each October, celebrates Phuket's Chinese community's belief that abstinence from meat during this period will help them obtain good health. Aside from the usual parties and parades, many walk on hot charcoals and pierce themselves with spikes and spears. Yikes. Every February, Moscow's locals celebrate the end of the bleak winter and the imminent warm rays of spring with a fist fight in the city's Red Square. This rather bizarre part of the week-long Maslenitsa festival is to commemorate Russian military history back when soldiers would fight in hand-to-hand combat. Alongside the fight, there is dancing and eating of Russian pancakes. Here's a fact: almost seven million cans of Spam are eaten every year in Hawaii. The cans of gelatinous pork were relied upon as a vital source of protein after the Second World War and are still so popular today that the island's Burger King chain sells a special spam version of its burgers. So it is no surprise that a street festival celebrating the pink blubber is one of Honolulu's most popular events. Every April, over 20,000 people crowd Kalakaua Avenue, the capital city's main drag, to scoff Spam Won Ton, Spam fajiitas, and Spam ravioli, all made by local restaurants. ustry which was just emerging in Port Lincoln, south Australia. kaZantip, which starts on July 20, covers all bases. Like music? Its speakers blare everything from techno to dub for 24 hours a day over five whole weeks. Like water sports? kaZantip takes place on the edge of Portugal's artificial lake Grande Lago, allowing people to wakeboard in front of the crowds. Prefer dry land? There are regular BMX, skateboard and breakdancing shows. Like exercise? Step, yoga and dance instructors are on site - and there's even the option of parachuting over the whole damn thing. The city of Rayne has a thing for frogs. This love affair began in the late nineteenth century when a Rayne chef started selling juicy bullfrogs to restaurants in nearby New Orleans. Today they show their affection through frog murals which line Main Street in downtown Rayne, and this festival that takes place every November over Labor Day weekend. Activities include frog racing and jumping contests, best-dressed frog contests (for humans) and, of course, the consumption of lots of lovely frog legs. The Spanish are at it again. If they're not running from bulls or jumping over tots, they're throwing tomatoes at each other. On the last Wednesday in August, up to 40,000 people head to Bunol in Valencia, to throw one hundred tonnes of tomatoes at each other. This food fight is all part of a week-long party of music, parades and paella-cooking which is believed to have started in the 1940s on a much smaller scale, of course. Once the hour of tomato-throwing is over, the crowd head to Bunol river for a big communal wash. This year Tunarama celebrated its fiftieth year of tuna tossing, a bizarre competition that was started in 1962 to promote the tuna industry which was just emerging in Port Lincoln, south Australia. Tunarama takes place over four days and always over January's Australia Day weekend. For ethical and mess reasons, real tuna has been replaced with fake in recent years. If watching grown men throw tuna in the air isn't for you, there's also a boat building competition, a keg rolling race and King Fish tossing for the smaller 11-15 year olds. In 1958 a group of farmers decided to throw a sheep shearing competition. Today more than 450 competitors from up to 25 countries head to Masterton in Wairarapa, east of Wellington, to shear some of the area's 30 million sheep over four very long days in front of crowds of spectators. Much has changed since the festival's inception: the prize money is higher and many shearers opt for training programmes and fitness courses - they're even campaigning to make it an Olympic event. This 400-year-old competition may appear cruel, but Japanese tradition says it's all for the good of the baby. Every April, in the Sensoji Temple in Tokyo, university club sumo wrestlers take turns to hold a baby and make it cry before the others. To do this, they growl, pull faces and, as a last resort, they even wear scary masks. The parents then pray for the good health of their child and for this ritual to ward off evil spirits. The bizarre festival of Noche de rábanos dates back to colonial times, when missionaries taught natives how to cultivate radishes. Every December the residents of Oaxaca City pay homage to the humble radish by cultivating giant versions and carving animals, humans, saints and other characters out of them. For the record, Pope Benedict doesn't approve of Spain's Baby-Jumping Festival, which takes place in Castrillo de Murcia, North West Spain each June. This bizarre festival dates back to 1620 and is the culmination of a 96 hour celebration of Corpus Christi. It ends with grown men, dressed as devils, leaping over young babies in order to cleanse their spirits. Once the jumping is done, the babies are sprinkled with petals and returned to their grateful mothers. The annual Tinku festival starts with a shot of local alcohol and finishes in a brawl that only ends when blood is shed. Tinku, meaning ‘encounter’ in Quechuaa is a ritual folk ceremony held in Bolivia’s rural Potosí region in May where local people get together and punch each other. This pagan tradition is meant to appease Pachamama, the Inca earth goddess, who apparently can only be cheered up by the spilling of human blood. It may be violent and strange but it must be a great way to get rid of any old grudges you have against your neighbours!